Gabi Garcia earned a first-round victory over Barbara Nepomuceno at Rizin 14, on December 31st, 2018, in Saitama, Japan. But immediately after the win, she almost had another fight! Her rival Shinobu Kandori entered the ring and confronted her! Gabi Garcia took Barbara Nepomuceno down to the canvas. She landed into side control. After only a few seconds, the BJJ black belt trapped Nepomuceno’s right hand, twisted it, and ended the fight via key lock midway in the first round. After this win, Gabi Garcia has an MMA score of 6 wins, zero losses, and one no contest. But the showtime was far from over! 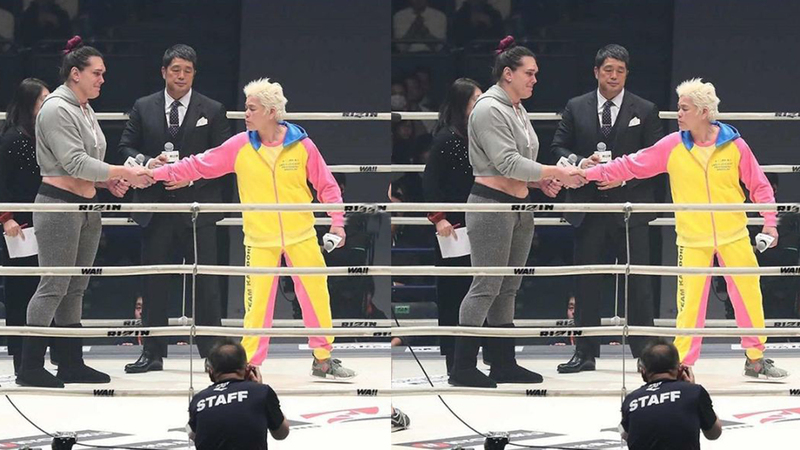 Gabi Garcia started to celebrate the victory, but Shinobu Kandori stormed the ring and called for a showdown against her! The security and teammates were forced to hold a 54-year-old Japanese competitor, who tried to deal Garcia on numerous occasions. The Brazilian fighter accepted the challenge. She also called for the creation of female Heavyweight division. Let’s remember, Shinobu Kandori was set to face Gabi Garcia two times. The first meeting supposed to happen on New Year’s Eve 2016, but unfortunately, the Japanese had to pull out due to a rib injury. The second clash didn’t come to fruition because of Garcia’s legendary weigh-in miss. She missed weight with 237 lbs, while the limit was 209 lbs! The Brazilian fighter had an extra 28 pounds!!! Later she offered an apology, claiming she had no choice but to stop the weight cut process because it almost killed her. What are your thoughts on this? Will one of the most controversial female fighters finally meet Shinobu Kandori? Rizin Published Ruleset/Trailer For Floyd Mayweather Vs Tenshin Nasukawa!